If you’re earning compound interest on an investment, this compound interest table and calculator can help you track your money’s growth, so you can see how it increases month by month. You can download the compound interest table and calculator absolutely free right here. So what is compound interest? When an investment earns compound interest, it means that interest is calculated not just on the principal amount of the investment, but also on the interest that the principal has already learned. As you’ll see in this compound interest table, this means that your money grows much more quickly than if interest was calculated based only on the principal. This compound interest calculator will help you see just how much your investment is growing every month. No matter the size of the investment or the amount of interest you’re earning, this compound interest calculator will keep you up to date on the details and help you predict future earnings. 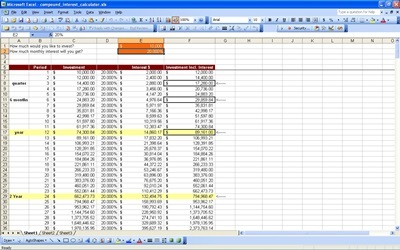 Download this free compound interest calculator for Excel to do all of your compound interest calculations. You’ll be impressed by how easy it is to perform complex compound interest calculations, thanks to this easy template. You’ll also be able to visualize the idea of compound interest with this compound interest template which shows any investment’s steady growth over time. You can take control of your finances with this compound interest calculator today. Click the link below to download the free compound interest calculator with built-in compound interest table to help you get a handle on your investments. If you want to calculate other functions besides compound interest in Excel, check out the dozens of related Excel templates or browse our extensive library for more free Excel templates.